Anish Kapoor has brought a liquid sculpture to the Brooklyn waterfront for his latest work of public art. Descension is a hot tub katabasis, an endless swirly into the depths of Brooklyn Bridge Park. The water, sculpted by a funnel, dialogues with the continuous flow of the East River and traffic over the Brooklyn Bridge in the near distance. 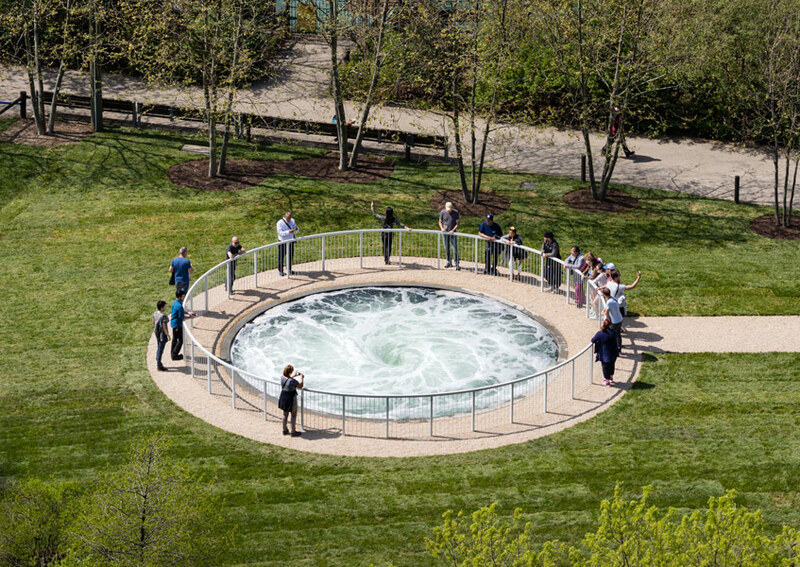 At 26 feet in diameter, the piece, presented here by the Public Art Fund, builds on Kapoor’s longtime exploration of emptiness (and could also be seen, depending on your politics, as an apt metaphor for the state of the world today.) Up close, its foamy surface—and gurgling machinations—feels peaceful. For safety reasons, a thin white rail encircles the piece to prevents toddlers and Pomeranians from drowning, but also creates distance between the visitor and the void. A video of the installation can be seen below. 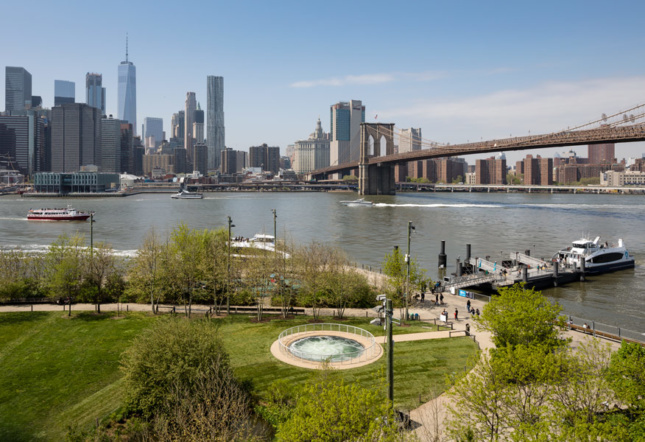 This is the nonprofit’s fifth year in Brooklyn Bridge Park, but it’s not the first time the Public Art Fund has exhibited work by the London-based artist. In 2006, the group brought Kapoor’s Sky Mirror, a 35-foot-wide concave mirror, to Rockefeller Center. “The fact that this is free [to visit] matters,” Kapoor said, at a press conference yesterday. “We believe that art liberates us, opens us, frees us, to have it as open access is a terrific thing,” a particularly rich observation from an artist who’s unapologetically hoarding the blackest black on earth. Descension is on view through September 10 at Brooklyn Bridge Park’s Pier 1.